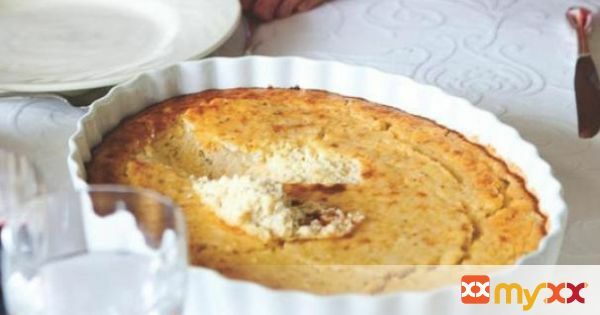 The cooking time of this savory pudding will vary greatly depending upon how hot the mixture is when it goes into the oven. You can make the corn mixture up to a day in advance, refrigerate, and then bake just before serving. If you choose to do this make sure to lower the heat to 350˚ and allow the pudding to bake a bit longer.This recipe is from My Family Table: A Passionate Plea for Home Cooking by Chef John Besh. Authorization to print courtesy of Andrews McMeel Publishing. 1. Preheat the oven to 425˚. Melt the butter in a heavy-bottomed pot over medium heat. Add the onions and garlic and cook for 3 minutes. Add the corn kernels and cook, stirring, for an additional 3 minutes. Add the flour and stir for 1 minute, then add the cream. Once the cream is incorporated, continue to stir until the mixture comes to a boil. Add the cooked grits, remove from the heat, and stir in jalapeño peppers. Taste and season well with salt and pepper. 2. With a hand-held immersion blender in the pot (or transfer the mixture to a food processor), purée the corn mixture while slowly adding the beaten eggs, until the eggs are thoroughly mixed in. 3. Pour the mixture into an ovenproof dish and sprinkle with the cheese. Bake for 25–30 minutes, until the center puffs and the corn pudding turns golden brown.